Original Ralphs Grocery Store at Sixth and Spring Streets in Los Angeles, 1886. Photo from the Security National Bank Collection at the Los Angeles Public Library. One of the most iconic food grocer outlets in Los Angeles is Grand Central Market in Downtown Los Angeles. The market first opened in 1917. 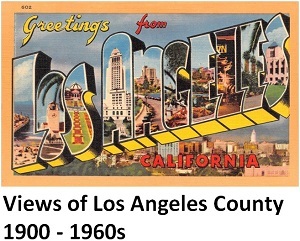 There are, however, a number of food retailers (versus restaurants; see Oldest Surviving Restaurants in Los Angeles County) that opened in Los Angeles County even before Grand Central Market and continue to operate today. Some of them even pioneered the concept of the supermarket we know today. George A. Ralphs opened his first store in 1873 in Downtown Los Angeles at Sixth and Spring Streets. The store initially catered to upscale customers and delivered groceries by wagon throughout Los Angeles. The stores were among the early pioneers of initiating self-service grocery markets. It store at 10861 Le Conte Avenue in Westwood Village, built in 1929 (renovated in 2015), is in the National Register of Historic Places and listed as a Los Angeles Historical Cultural Monument. It is also the largest Ralphs store in Southern California. Through a series of buy-outs and mergers, Ralphs now falls under the umbrella of the Kroger Companies of Cinncinatti, Ohio. Galcos was first opened in 1897 in Downtown Los Angeles by Galioto and Corto Passi as one of the first Italian grocery stores in the city. The store was purchased from the Passi family in 1940 and continues to be operated by the same family until today. The store was moved to Highland Park in 1955. In 1995, current operator John F. Nese began dramatically expanding his selection of soft drinks with smaller, less known brands. He was protesting the unfair pricing of large soft drink brands against smaller independent grocers. Galcos is now known for its huge selection of hundreds of different brands of soft drinks and beers. First opened in 1903, Fugetsu-Do Confectioners appears to be the oldest operating confectionary shop in Los Angeles County. The shop was opened in the Little Tokyo District of Los Angeles by Seiichi Kito, an immigrant from Japan, and partners. By 1928, Kito found himself sole owner. Sadly, in 1941, the Kito family were forced to sell off their stock cheaply and put their confectionary-making equipment in storage due to the forced internment of U.S. persons of Japanese ancestry during World War II. They were interned in Wyoming during that period of time. After returning to Los Angeles in 1945, family members took restaurant work in order to raise enough money to get their equipment back from storage. In 1946, the Kito family was able to reopen Fugetsu-Do on First Street where it continues to be operated by the founding family. Fugetsu-Do is one of the three who are said to have invented the fortune cookie. In 1906, Charles Von der Ahe, an immigrant from Denmark, opened his first Vons grocery store in Downtown Los Angeles at the corner of Seventh and Figueroa Streets. His approach, unlike that of the Ralphs stores, was to serve the neighborhood with “cash and carry” rather than “charge and deliver.” By 1928, Von der Ahe was operating 87 grocery stores. Although Von der Ahe sold his chain in 1929, his sons, Ted and Will, reopened Vons stores in 1933, even in the midst of the Great Depression. In 1948, the Vons brothers opened a new store at the corner of Santa Barbara (now Martin Luther King Jr.) and Crenshaw Boulevards that was among the first to offer pre-packaged perishables, self-service produce, and a meat and deli department. Vons launched their Pavilions stores in 1985. By 1997, the company was fully merged with Safeway, Inc., and now falls under the umbrella of the Albertsons Companies.